This is a classic 9 days Jumolhari Round Trek which starts from Drugyal Dzong near Paro and ends at Dodena just close to Thimphu. The trail goes through two high passes from Jangothang. The view of Jumolhari mountain (7,314 m) from Jangothang is spectacular. This is strenuous trek but a very popular. -Drive to Drugyal Dzong (a ruined fortress - 16 kms away from Paro town). The dzong, although in ruins, holds great historical significance. It was from this fortress that the Bhutanese repelled many Tibetan invasions. The name means "The Victorious Bhutanese." This spot unfolds a magnificent vista of Mount Chornolhari, "Mountain of Goddess" (Alt. 7329 mtrs). Visit a typical Bhutanese farm house on the way back. Overnight at hotel. -It is a bit stressful trail as one needs to do bit of climbing. The trail goes up beyond the camp, then will pass through an army camp at 3,730 m – then the trail crosses a wooden bridge over a fast flowing stream a short distance beyond the army post. A short climb leads to a small chorten on a ridge. The valley begins to widen again. All around high mountain ridges and snow-capped peaks come into view. Yaks and yak herders' winter homes become a regular feature of the landscape. The night camp is beneath a ruined fortress at the base of Mt. Jumolharii. 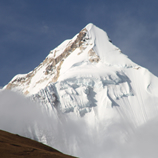 -Trek up to Tsophu or hike around the area. There are good short hiking trails in three directions. Jumolharii and its subsidiary mountain chains lie directly West, Jitchu Drake to the North and a number of unscaled peaks to the East. -A day excursion to Tsokha (Lake) which is at the base camp of Jitchu Drake. Blue sheep and musk deer are plentiful along the trek route. Distance 15 kms. About 3 - 4 hour's journey. Altitude of Tsokha - 4500 mtrs. 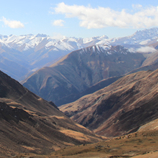 -The trail climbs up to the Yalila Pass at an altitude of 4820 mtrs. From the pass, you can get an excellent view of Mt. Jumolhari, Tserim Gang and Masagang on a clear day. The trek from the pass to camp site at Shodu is steep downhill. Camp can be made in a stone shelter or in tent. -The trail follows the Thim - Chu through forests of Rhododendron. Waterfalls can be seen along the way. The valley narrows till the path takes to the slopes and gradually ascends to reach the ruins of Barshong Dzong. Camp can made in stone shelter or tent. -The trail descends through thick forest of Rhododendron to meet the Thim- Chu and then ascends to pasture lands. Camp is in a meadow. -The trail makes a long ascent through conifers forest areas to a pass at 3,510 m. From here then the trail goes down to the river and follows it southward to the road opposite the bridge that leads to Chari Goemba. -Visit Tashichho Dzong - the main Secretariat Building. It is from here that the the country is administered. The Head Abbot and the central monastic body also reside here during the summer. Wander through the town, visit shops and the Handicrafts Emporium, where Bhutanese textiles and other handicrafts are available. Visit the workshop where the handicrafts are made. -Visit the painting and woodcrafts schools where traditional painting and other arts are kept alive. Also we will take a tour of the National Library and see the ancient manuscripts preserved there. Simtokha Dzong (6 kms. from Thimphu), the oldest Dzong in Bhutan built by Shabdrung Ngawang Namgyal in 1629 AD will also be visited.The Simtokha Dzong houses the largest monastic school in the country.